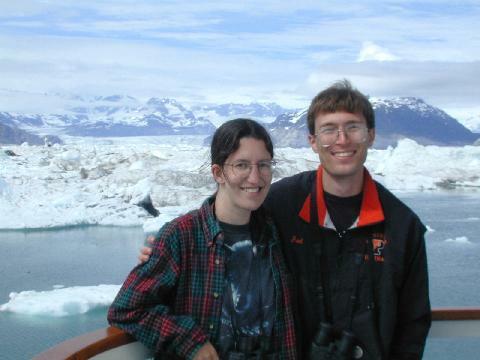 After our wedding, Joel and I went on a honeymoon to Alaska. Our hope was to see lots of wildlife and pretty scenery, so we chose to go on a three-day cruise around Prince William Sound followed by a train ride into Denali National Park. We had a wonderful trip and hope to remember it for a long time. These pages are an album of our vacation. They contain pictures and descriptions of the sights we saw. We hope you will enjoy reading about our experiences. Each picture has a caption that you can read by dragging your pointer over the picture. In order to keep our honeymoon as stress-free as possible, we bought a complete travel package through our travel agent. We probably would have had very different experience in Alaska had we gone out on our own for hikes or kayak trips. Admittedly, some parts of our trip were kind of silly and touristy. In all cases, though, it was helpful to have tour guides with us as we visited the sights. We learned much more about the history, culture, and geography of Alaska than we ever would have if we had been traveling independently. In preparation for our trip we got a digital camera. The camera was actually a present from my parents in memory of my grandmother, Nell Kerr. We had a lot of fun learning how to use the camera as we went along, and the view screen on the camera gave us instant feedback on how our photographs turned out. This album is dedicated to Nanny. Although she didn't like to travel much herself, I know she would have loved to see the pictures.